2. 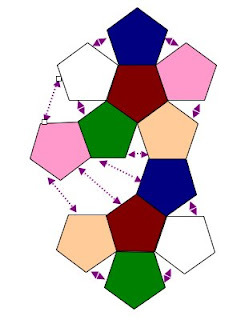 Sew your pentagons together to create a ball - I hope this diagram helps to show how this is done. 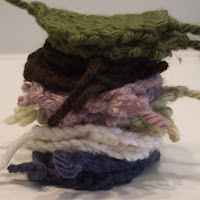 I used a contrasting yarn in blanket stitch to add an additional decorative element. Remember to leave at least one seam open so you can stuff the ball! 3. Stuff the ball and stitch remaining seam(s) shut. Then all you need to do is find someone to play ball with you ... Castro didn't seem to want to play ball - but he did agree that it was a very soft! If you have enough remnants to make another, I'd buy one in a heartbeat!! What a fun project, one little doggy seems to love his! 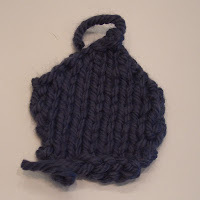 Well done Rachael on getting this tutorial on the Craftzine site!! Looks like your 4 legged friend loves the ball. How clever are you? Great graphics! Your puppy looks so very sweet! Congrats on your well deserved fame! just wanted to let you know that i think this is fantastic, and posted about it on the daily chum. 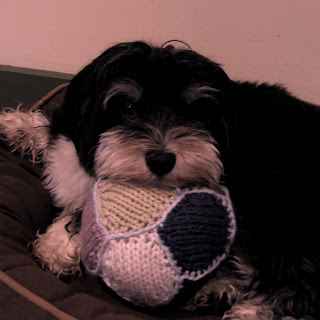 i love that knit ball. that dog is too cute!!!!! I have one very interested cat who has just wandered over to the huge moutain of left over yarn. His message is very clear. He wants one of those. The duckie blanket is fabulous, designing pictures is just a tad tricky, but you did a great job. This is sooooo cute. What a great project. Rachel, have you submitted this to Whip Up? They love featuring tutorials. what a great idea. i bet my kids could accomplish this. it would keep their hands busy and they could all make parts to put together for the whole ball.thanks for the great idea. What a fabulous idea!!! These would be perfect as a baby toy, maybe even with a little bell in the middle (if done safely) it would be incredible!! Love it! I just started this pattern which is just what I needed for a gift and I noticed that the top sides of the pentagons are coming out longer than the bottom sides. Any suggestions on what to do? TO: VT Knitter - please contact me at rachael@rachaelrabbit.com and I would love to help you. I tend to knit very 'tightly' I don't know if that is the correct technical knitting term. And for any stuffed toy or ball I use needles 1 or 2 sizes smaller than the yarn calls for. 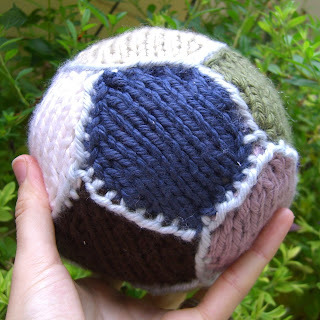 For example - this ball was knitted with yarn that asked for size 10 needles - but I used size 8. It just means that when I come to stuff the item - the knitting - when stretched does not show/leak the stuffing. 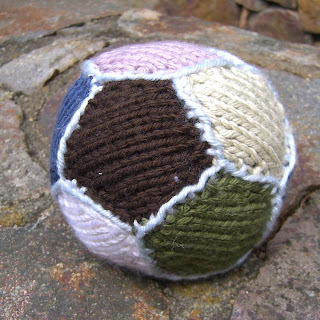 The pentagon is not exact/perfect geometrically - but once all the pieces are sewn together it works well to make the ball shape. I really hope that this helps you. I made one of these 15 years ago, and one more for a great nephew. They are a fantastic gift and color combinations are endless I'll put the pic up soon.